"To be a good cake maker has always been the commendable ambition of every housewife...[a cake served at the end of a meal] can be compared to a lecture, an orchestral rendition, or a beautiful soprano solo by an artist." 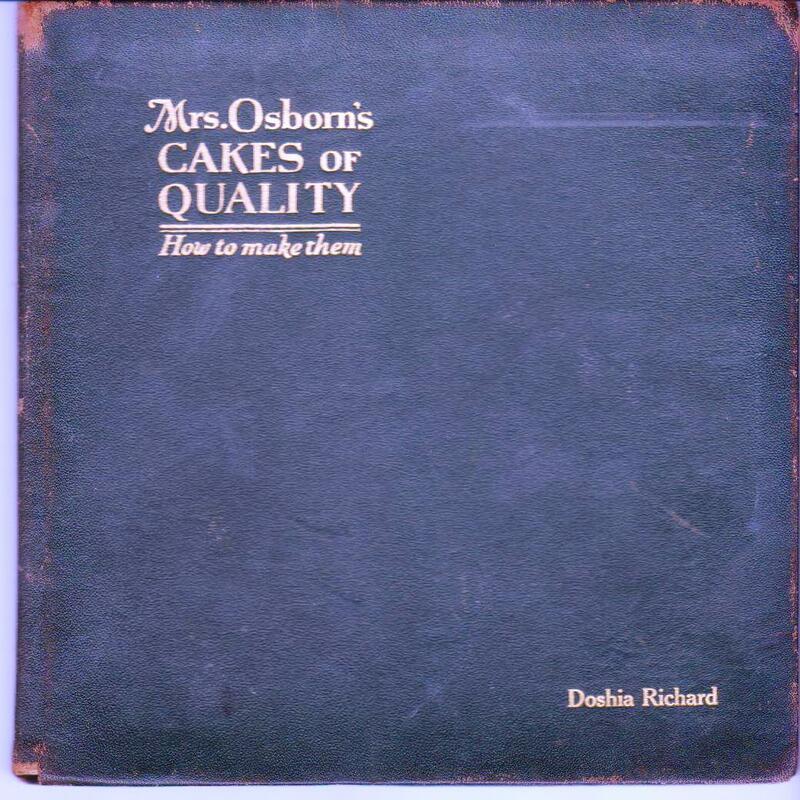 So wrote Mrs. Grace Osborn in her c. 1919 book, Mrs. Osborn's CAKES of QUALITY, How to make them. I first came across this volume years ago, when I picked up what is probably a prototype copy (above) at a roadside flea market in the Adirondacks. Its home-grown appearance is endearing: a bunch of typed sheets of parchment-like paper bound within brown cardboard covers by a piece of string. Recently, on Amazon, I was delighted to find a more professionally published version (below) of the book (the fifth edition! ), which is smaller and illustrated -- and not hand-typed. Both have a copyright by C.T. Porter of Bay City, Michigan. 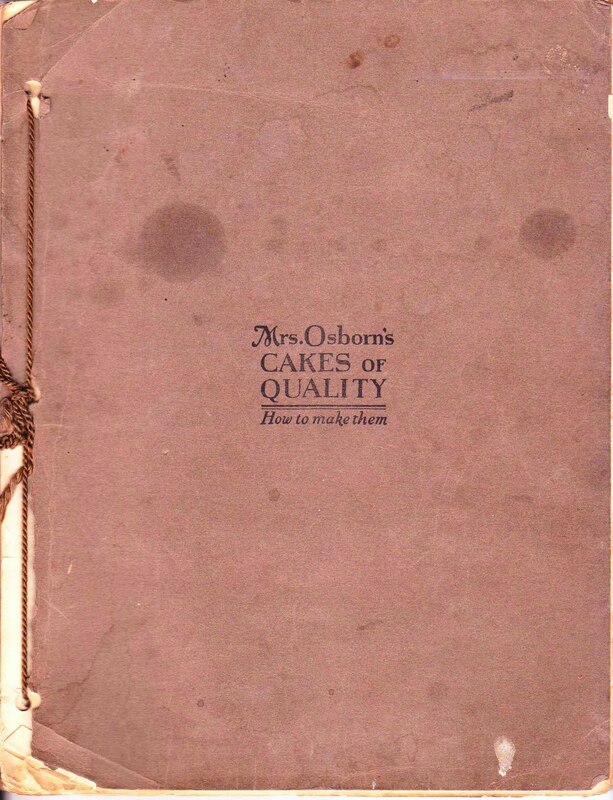 I'm trying to find out more about the very entrepreneurial Mrs. Osborn. Her haughty know-it-all tone (see example below) strikes me as coming from someone to whom cakes should be served, not someone slaving away week after week in front of a hot oven to earn money. I imagine that her husband left her with five young children to support, or that she otherwise suddenly found herself without enough money to live. Or maybe she just really wanted to share her revolutionary cake baking methods (putting the pans into a cold oven, among other things) with the world and make money doing so. I called the Bay City Historical Society and was instructed to write an old-fashioned letter (no email here!) to the Butterfield Memorial Research Library and for $5 per hour, a librarian will do the research. It will take a month to six weeks -- apparently they have someone working on these requests for four hours each week. I sent the letter yesterday, but forgot to tell them about this card (below) that I found inside the prototype book. 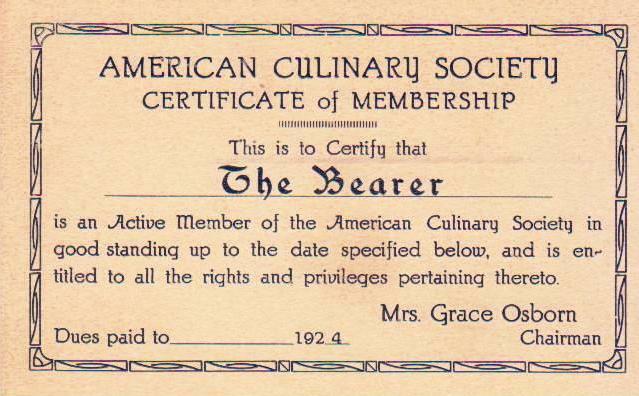 Apparently Mrs. Osborn founded the American Culinary Society which no longer exists (if it ever did). So now, I need dig up the address again and write an addendum to my research request, to include this information. These days it's easy to forget how easy email is! Mrs. Osborn's confidence and success is inspiring. 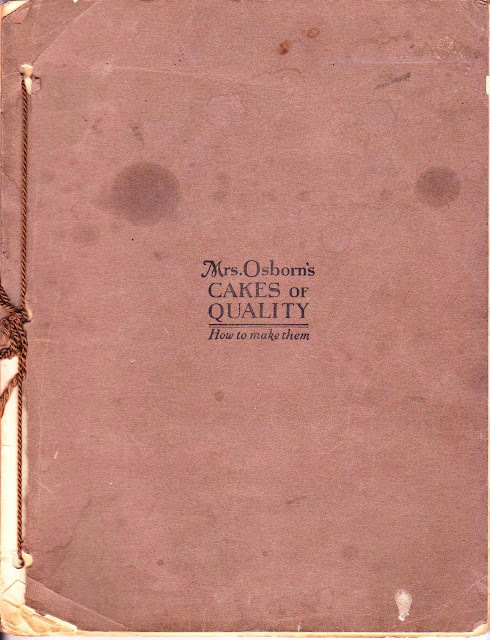 "Make your work PERFECT," wrote Mrs. Osborn at the end of her book, "and all the rest will be easy, even to riding in a Buick Six as I do, earned by the sale of Cakes of Quality." ah, susan, i'm now waiting for you to earn enough from your cakes for a buick 6 or even a vw bug!! Mrs. Osborn also sounds like she may have been on her last nerve! Perhaps her husband met a tragic demise when he didn't follow one of her directions given "as explicitly as the English language could state them." Follow up on you advice about the Cake Bible. Dory made Steve a checkerboard cake, took it out when the edge came away from the pan, tooth pick came out clean... And sure enough a big hunk of the center was totally uncooked!! @Paul: Good thing you're a patient sort. @Margaret: How very frustrating about that checkerboard cake. The toothpick test is ususally foolproof. 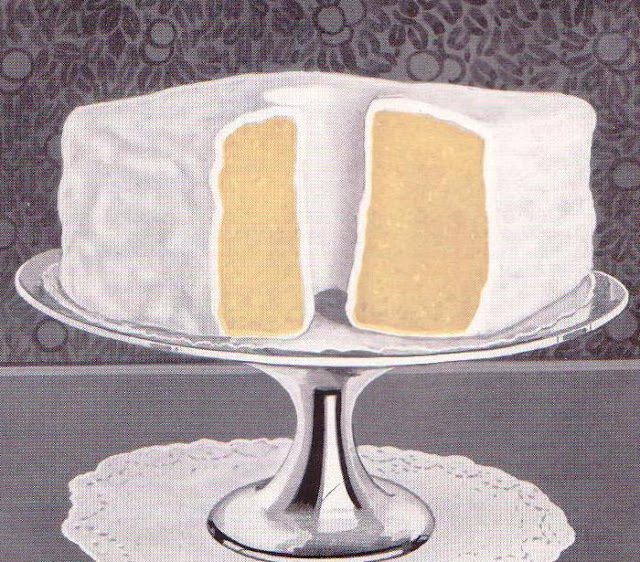 But I once made the Cake Bible buttermilk cake and the same thing happened. It was meant for a gift and, out of time, I simply removed the center and filled it with strawberries! I bought a prototype book earlier this evening at a rummage sale. Did you hear back from the historical society? What did you learn? @Culinary: I did hear back and wrote about it in a post whose headline says it all: Bad News from Bay City. They had no information. I did find someone with the same name who worked as a laundress at a Bay City hotel, but nothing beyond that. When you say "prototype" do you mean a book that looks like the one pictured at the top of this post? I am from Bay City, Michigan, I think this makes for interesting news. Madonna is from there, now this, pretty cool. Anonymous: I had no idea Madonna is from Bay City. And I've been doing a tiny bit of research about "Mrs. Osborn" and it appears that there may have not been such a person, and that she was created by a married couple to help personify their business!! I did some checking in some historical newspaper archive subscriptions I have (for genealogy) and found the answer to "Mrs. Osborn", she was the mother of Mrs. Grace R. Thompson Porter. I have attached some family info and ads for the cookbook. 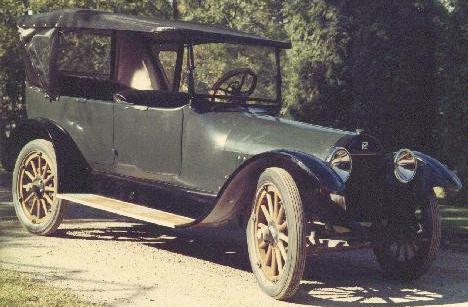 It looks like Dr. and Mrs. C. Frank Porter, Bay City, MI, started the company just about the time their son, Charles Thompson Porter was to graduate from Univ, of Michigan, then came the war. On his WWI draft reg card he lists his occupation as Mail order business, self-owned. (Mrs. Osborn had died, Jan. 12, 1907, Sandusky, Erie County, Ohio. A nice tribute.) As to who's recipes, Sarah's or Grace's, I don't know. I also see a later update on a copyright filed for the Cookbook in 1939, I suppose by the son of Grace, since Grace passed in 1921. So, her company's name was, Mrs. Grace Osborn, Inc.
Also, MJ, I'll do a follow-up post dedicated just to this, so if your mother has any recollections, email me at visit.susan@gmail.com, and I'll add them in. Thanks again! Are Even Today's Recipes SUPERSIZED? "Yer darn tootin', I like Fig Newtons"
What's a pork chop doing on this baking blog?